This mid-century cocktail set consists of a cocktail shaker glass with a lid, seven tumbler glasses, and one lowball glass. This set is detailed in red, green and yellow graphics. 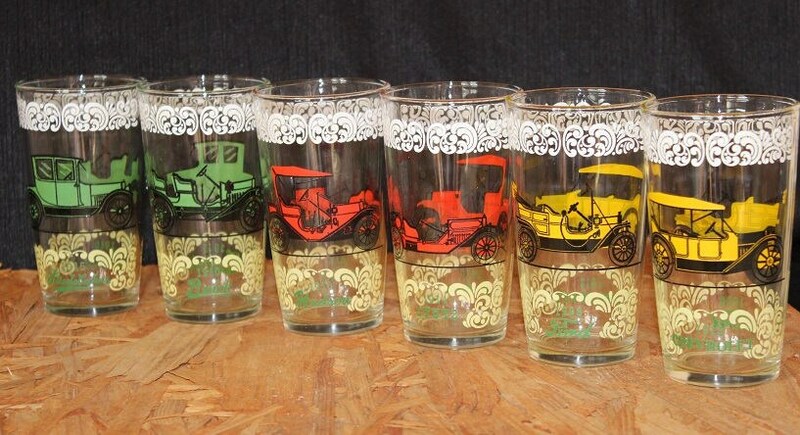 Six of the glasses have a white scrolled pattern at the top, a yellow scroll pattern at the bottom, and a different classic car on opposites sides of the glass. 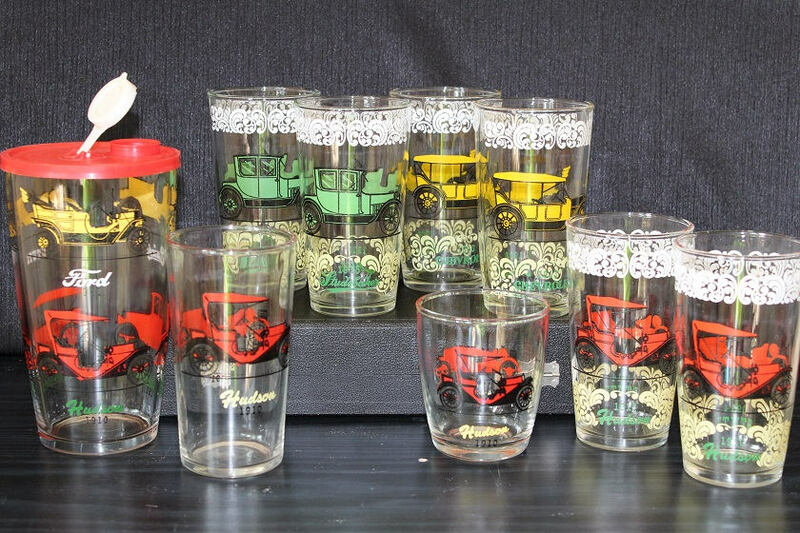 Illustrated in yellow is a pair of glasses with a 1913 Chevrolet and a 1908 Ford; in red is a pair of glasses with a 1914 Stutz and a 1910 Hudson; and, in green is a pair of glasses with a 1910 Buick and a 1915 Studebaker. Circling around the top cocktail shaker in yellow is 1910 Buick, 1914 Stutz and a 1908 Ford. 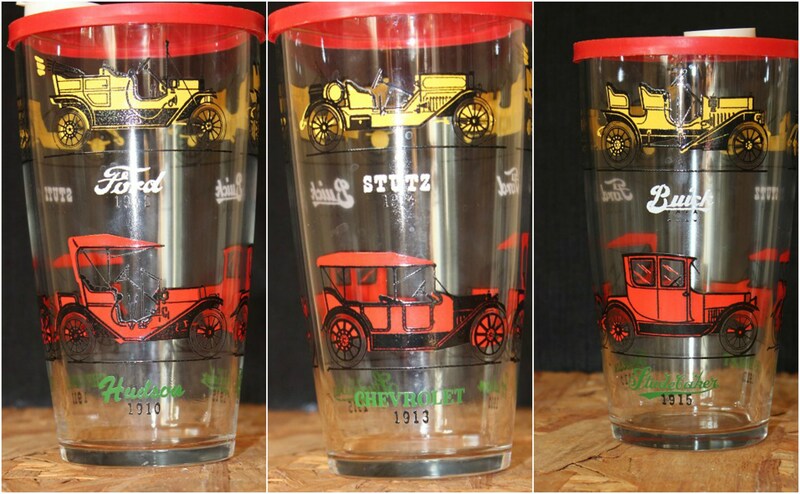 At the bottom of the shaker in red is a 1910 Hudson, 1915 Studebaker, and a 1913 Chevrolet. 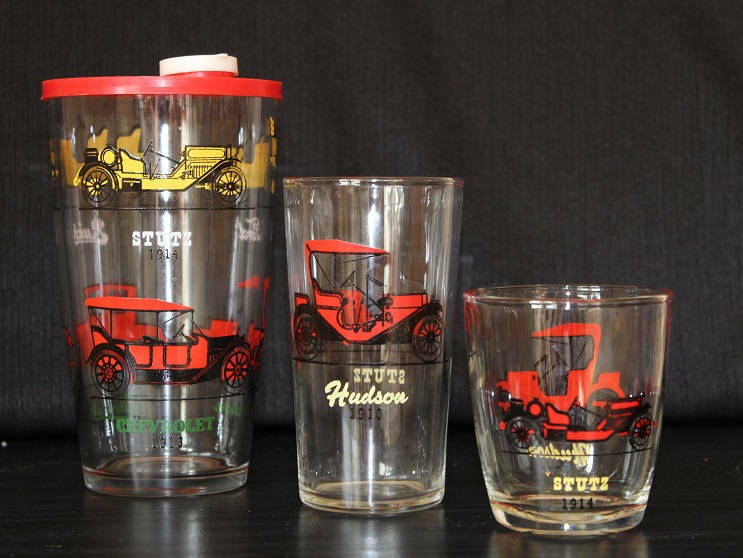 There is a matching lowball and highball glass with a 1914 Stutz on one side and a 1910 Hudson on the opposite side of the glass. The mixing glass is topped with a red plastic lid with a pop-up top and is stamped with the Anchor Hocking "A H " logo on the bottom. This cocktail set is in excellent condition with no chips or cracks and vivid graphics.